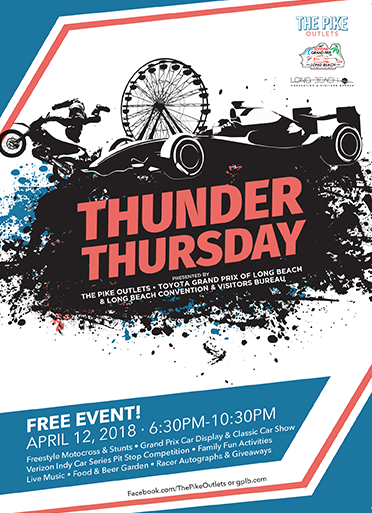 Thunder Thursday at The Pike Outlets, the free-to-the-public festival that annually kicks off the Toyota Grand Prix of Long Beach race weekend, will take place on Thursday, April 12, and have plenty of fun for the entire family. Presented by the Long Beach Convention and Visitors Bureau, Thunder Thursday’s activities begin at 6:30 p.m., with Verizon IndyCar Series pit stop competitions on Shoreline Drive, west of Pine Ave., taking place at 6:45 p.m. and 7:45 p.m. Tony Carbajal’s stunt motorcycles will wow the crowd at 7:05 p.m. and 8:05 p.m. and the always-exciting freestyle motocross demonstrations will take over Shoreline Drive at 7:30 p.m. and 8:30 p.m. Spectator viewing for these events will be located in and around the three grandstands adjacent to The Pike Outlets at Pine Ave. and Shoreline Drive. 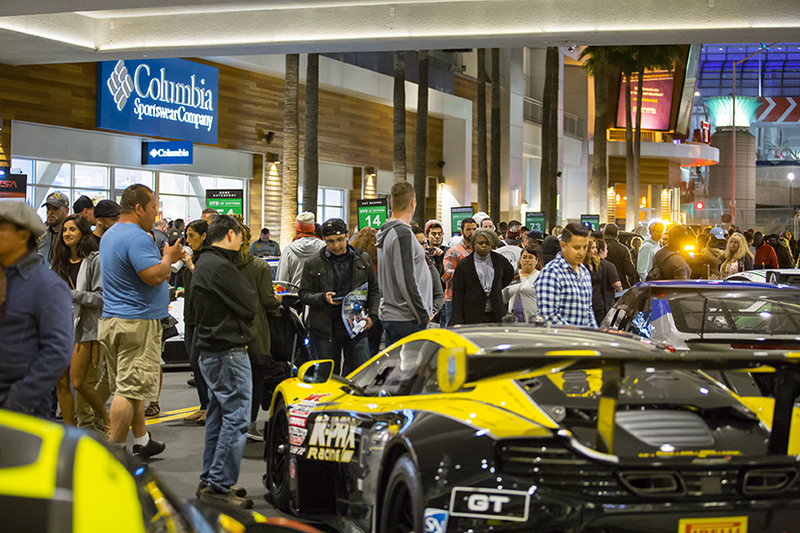 “Thunder Thursday is the kickoff event for all the action and excitement of the Grand Prix weekend, and we’re looking forward to a great opening family-friendly party!” said Steve Goodling, president & CEO, Long Beach Convention & Visitors Bureau. Within The Pike Outlets, fans will enjoy live music from The StrayTones and Hearts Like Lions, as well as live DJs on the stage in the Main Plaza. Food will be available in the Main Plaza, as will, for fans 21 and older, a Beer Garden hosted by the Auld Dubliner. Car enthusiasts and racing fans will find a classic car show located on The Paseo, with local antique and vintage cars. Meanwhile, race cars will be displayed on Bay Street with professional drivers and crews from the IMSA WeatherTech SportsCar Championship, Pirelli World Challenge and more signing autographs. Parking for Thunder Thursday at The Pike Outlets will be available in the Pike Parking structure at Chestnut Place off of Ocean Blvd. The Toyota Grand Prix of Long Beach will take place April 13-15. For more information, visit gplb.com. The Pike Outlets is a 390,568 sf retail property owned by DDR Corp. in the heart of Downtown Long Beach, California. Located off of Shoreline Drive and Pine Ave, The Pike Outlets is a premier destination for shopping, dining, and entertainment. The Pike Outlets has a number of great fashion retailers featuring apparel that holds appeal across a wide spectrum of shoppers. The retailers are complemented by restaurants and nightlife options that make the property much more than just a hub of shopping such as a movie theatre, comedy club, and the iconic Ferris Wheel. Formally known as The Pike, the property underwent a redevelopment in 2014 and was rebranded as The Pike Outlets.